By 1852 the town was quite well established, as an entry in Doble’s diary reported there being some two hundred houses in the camp. A post office was established on January 21, with Charles Crane the first postmaster. A stamp mill was also built that year, with a school soon following, as well as a small Catholic Church located on a hill above town. The camp reached its peak around 1856, with the discovery of quartz gold deposits helping to increase the town’s good times. By 1857 there were four mills with a total of fifty-two stamps, and three arrastres busily crushing ore.
Drytown fell victim to fire twice during the 1850’s, the first blaze occurring in 1855 and the second in 1857. The first fire burned mainly the Chileno section of town, as that was what it was meant to do. It was set in revenge for the Rancheria Massacre of August 6, 1855, in which six persons, mostly Americans and including one woman, were slaughtered by a group of Mexican bandits using guns, knives, and an axe. “The flames spread rapidly,” an eyewitness reports, “...our citizens who rushed to the rescue were dragged away, and pistols pointed at them for trying to arrest the progress of the fire....One lady and two children came near being burned. The whole town...was soon consumed.” The American ruffians then supposedly torched the town’s Catholic Church. When the violence in the region finally ended, vengeful Americans had lynched more than twenty Mexicans in retaliation for the massacre, even though many of them had nothing whatsoever to do with that event. The fire of 1857 was the end of Drytown. The gold was already showing signs of being played out and when the fire destroyed most of the town, it never recovered. The buildings were not rebuilt as most packed up their belongings and headed for richer diggings. The local Butcher Shop had its beginnings in the 1860s. This small, brick structure is also in remarkable condition, looking much today as it did when first built. The marble floor of the front porch was cut from the Fiddletown quarry and hauled to town by mule team. The porch is fronted by two arched doorways, probably fitted with iron doors at one time. The inside walls were once completely plastered over, but now the coating is beginning to crumble away. Photo circa 1891. This old Brick Store, with its iconic iron doors, sits right next to the highway as you enter town from the south. The building was put up during the 1850s and is said to have been used as a mining office and print shop by George Hearst. It's housed an antique store for as long as I've been driving by. The town's Cemetery is located on a low hill amidst a residential portion of town. A small bell is mounted atop a cement foundation, perhaps St. Steven's Catholic Church once stood on this site. The church was probably built around 1853-54, and was burned after the Rancheria Massacre. 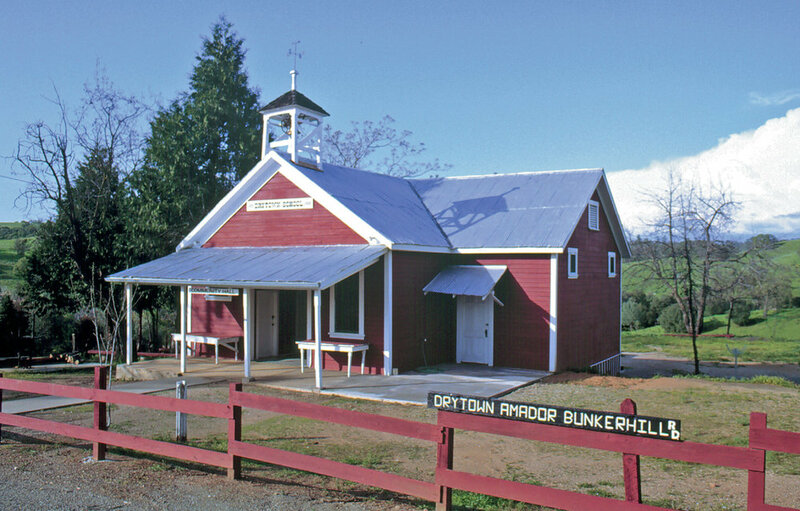 The Drytown Schoolhouse is believed to be one of the first in Amador County. Located on Bunkerhill Road, it is in excellent condition due to the efforts of local and county citizenry. The ruins and sites of several Old Mines are scattered about the hillsides along the old road between Drytown and Amador City. Going up past the schoolhouse, along new Chicago Road, the evidence of a once extensive hard rock mining industry are quite visible. Old headframes, mill and building foundations, and tailing piles still remain even though the mines haven't been worked in over seventy-five years. Now cows graze where once men mined.